Is There Ever Enough Thyme? Thyme has been used for various purposes throughout the centuries. In medieval times, Thyme was regarded as a plant that imparted courage and vigor. The ancient Romans considered it a remedy for melancholy. Thyme is a herb that is recorded throughout human history. Historians believe that the ancient Sumerians were the first to cultivate thyme, possibly as early as 5,000 years ago. The Sumerians were the first to discover thyme’s antiseptic properties and used it as an anti-fungal and a disinfectant. Thyme, along with roses were used to add fragrance to the home. The ancient Greeks used thyme for incense while the Romans were known to add thyme to cheese and alcoholic beverages. 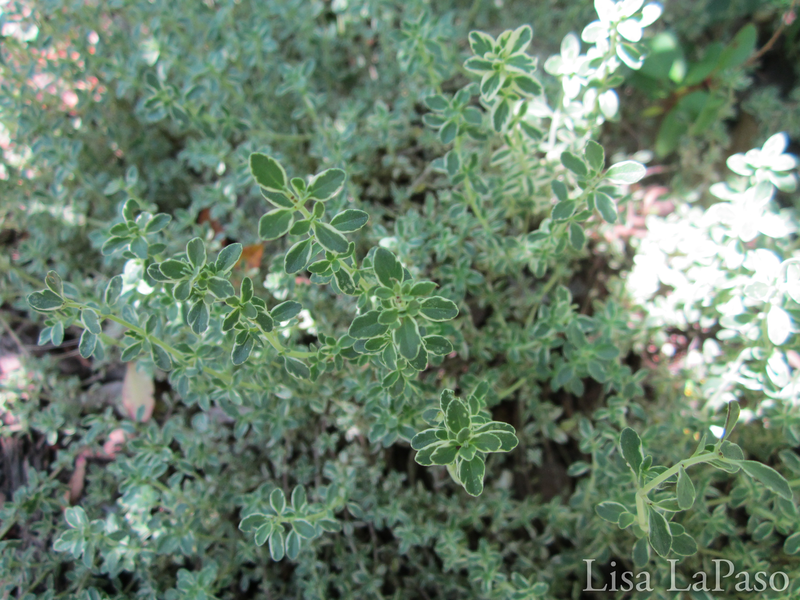 There are about 350 species of thyme including the many cultivars. Since they readily hybridized in cultivation, their classification is quite complex. Many species are good garden plants, having a neat habit, fragrant foliage and small pink or lilac flowers. Although the flowers are small they are very numerous, and they produce an abundance of nectar, making thyme flowers a favorite of the honey bee. Some of the finest-flavored honey comes from thyme nectar. Thyme plants are perennials, belonging to the mint family, and exist in various shapes and colors. The plants can be erect and bushy, reaching 18 inches in height or creeping and spreading, growing to about 3 inches high. The flowers and leaves come in a multitude of colors and therefore have a great number of delightful names. The leaves have unique aromas providing a variety of odors such as pine scent, a camphor-like scent, caraway scent, lemon, orange, tangerine, celery, or a eucalyptus-like scent. The unique aromas and flavors of the various thyme plants are the result of subtle differences in the terpenoid composition of the essential oil they contain. Thyme is one of the most fragrant and pleasant greenery’s to have growing in your garden. Their small size makes them ideally suited to crevices in paving, rock gardens, and containers. They thrive in stony or rocky situations and loves plenty of sunshine. They can be used in the garden to deter beetles and other cabbage pests. For healthier growth it is important to trim them after flowering and also remove the dead flowers. Sprigs can be picked during the growing season and used fresh or dried. Some of the most common used culinary Thymes are the common thyme (Thymus vulgaris) and lemon thyme (T. x citriodorus), while the most commonly used medicinal thymes are common thyme, Spanish thyme (T. zygis), and creeping thyme (T. serpyllum). They are all native to southern Europe and Western Asia, but they are now cultivated commercially in many parts of the world. Much of the commercial thyme comes from Spain, which has 37 varieties of thyme. The fresh or dried leaves of thyme as well as the flowering tops are widely used to flavor soups, stews, baked or sautéed vegetables, casseroles, and custards. Thyme provides a warm tangy flavor, somewhat like camphor, and can retain its flavor in slowly cooked dishes. Thyme can also be used in potpourri and moth-repellent sachets. Thyme can be used not only to flavor foods, but is also added to soaps, toothpastes, cosmetics, perfumes, and antiseptic ointments. The oil is used in aromatherapy to relieve pain and elevate mood. In addition, it may have a calming effect in stress-related conditions. Thyme baths have been used to help relieve aches and joint pains. Therapeutic Use Thyme contains an essential oil that is rich in thymol, a powerful antiseptic, antibacterial, and a strong antioxidant. The oil of thyme is used in mouthwashes to treat inflammations of the mouth, and throat infections. It is a common component of cough drops. Because of its essential oil, thyme possesses expectorant and bronchial antispasmodic properties, making it useful in the treatment of acute and chronic bronchitis, whooping-cough, and inflammation of the upper respiratory tract. Thyme enhances the action of the cilia in the bronchi and directly acts on the bronchial mucosa. Terpenoids, responsible for the expectorant activity, while a variety of flavonoids are responsible for the spasmolytic effect of thyme on the bronchioles. All the members of the mint family, including thyme, possess terpenoids which are recognized for their cancer preventive properties. A tea can be made by adding one teaspoon of crushed thyme in half cup of boiling water, letting it steep for 10 mins and then straining. The tea can be drunk 3 to 4 times a day for the treatment of coughs. The tea may be sweetened with honey, which also acts as a demulcent, thereby increasing the tea’s effectiveness. Thyme is entirely safe to use and has no side effects, although the essential oil of thyme may be irritating to the skin and mucous membranes, and may cause an allergic reaction. I think Thyme is a beautiful plant and personally have the common, Lemon, and variegated Thyme’s, I also like to use Thyme in my landscape designs between stones, where the fragrance can omit just by stepping on it, and in small spaces where something low growing and evergreen can be used, like the death strips most of have in new subdivisions where you have a small space of grass between the side-walk and the street. Removing your sod and adding evergreen herbs and perennials not only looks better, it saves water too. Thyme is also great in pots, as a ground cover and along the edge of your perennial beds. Visit your local nurseries and discover the many varieties you might find in Central Texas and create some interesting new ways to use this delightful herb to enhance both your space with taste with style.